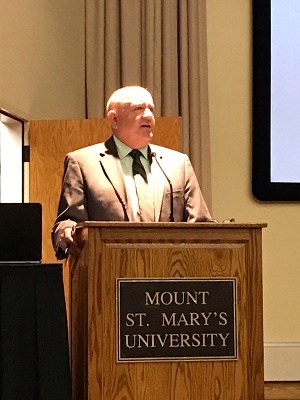 Mount St. Mary’s University Professor of Political Science Michael Towle, Ph.D., on October 3 presented the Fall 2018 Ducharme Lecture, “Elections to the U.S. House of Representatives: Problems and Possibilities.” With the timeliness and relevance of the topic, the lecture attracted an exceptional turnout by both students and faculty. Provost Boyd Creasman, Ph.D., welcomed the audience, and Dean of the College of Liberal Arts Peter Dorsey, Ph.D., introduced Towle. 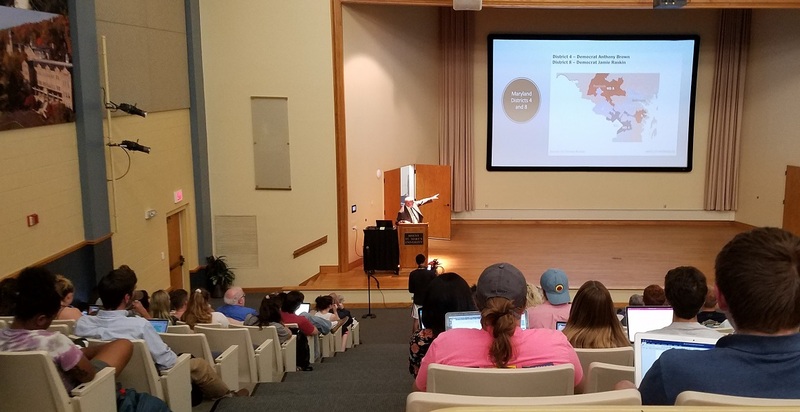 Towle began his lecture by discussing the current polarized political climate that has affected both representation in Congress and the ability of its members to work together toward common goals. Gerrymandering has resulted in disproportional representation in many states. When compared to the population in a state, the percentage of a major party’s representation may be considerably more than the electorate’s party affiliation. For example in Pennsylvania 39 percent of the electorate identifies as Republican, yet Republicans hold 12 of the 18 House seats, or 66 percent. Parties do this to maintain the political status quo and to prevent any significant challenge to incumbent representatives, Towle explained. Towle then presented a striking visual representation of the growing partisan divide. He used a video to illustrate how over the past 60 years the members of Congress have become less willing to cross party lines to advance a mutual agenda and increasingly vote according to party blocs. Towle offered several examples of voting methods in other countries that are used to balance representation. Israel employs a “proportional-list system” in which citizens vote for a party instead of a candidate. Each party seats representatives equal to the percentage of the votes they receive. Germany uses a “mixed-member-proportional system.” Citizens vote for a candidate and a party. The elected candidates are seated, and then the remaining seats go to members from the winning parties by percentage. Neither of these systems, Towle believes, would be easily accepted by U.S. voters. Because the U.S. Constitution makes no distinction on how districts should be represented in each state, Towle suggested that two members be elected per district instead of one. 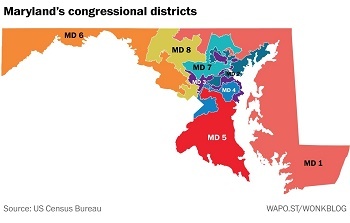 For example, Maryland would have four districts with two representatives each rather than eight districts with one. Two-person districts, in combination with new voting methods, might incline candidates to reach out to members of other political parties and to independents. Towle suggested that “ranked-choice voting” be used in this new system. Voters would be given a list of candidates and would rank them in order of preference. Through a process of elimination, two of the candidates would be elected to represent one district. This might encourage candidates to seek votes from several voting blocs since they only need enough votes to finish second to be elected to a seat. Maine will be the first state to implement this method, and the rest of the nation will have the opportunity to observe the outcome. Towle has taught political science at the Mount since 1991. He earned his bachelor's degree from Georgetown University and a doctorate in government from the University of Texas. His teaching and research focus is on American national politics. Recently, he has been conducting concentrated research in the area of voting systems and is currently co-authoring a book about ranked-choice voting. Towle’s first book, Out of Touch: The Presidency and Public Opinion, compares the changes in the ways former presidential administrations looked at and understood public opinion as the presidents’ popularity declined. As a political commentator, Towle has been featured in U.S. News & World Report and The Baltimore Sun. The Ducharme lecture is available in its entirety on the Mount’s Livestream: https://livestream.com/msmu/events/8398452.